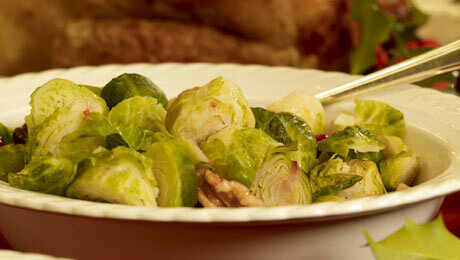 This is a fantastic way of cooking the Brussels sprouts and it makes for a very interesting option. Trim Brussels sprout taking off the rough outer leaves. Make a cross with a sharp knife in the bottom of each. Bring a pot of salted water to the boil and add the sprouts. Boil for 6-8 minutes until soft and tender. Strain off the water. Meanwhile, in a large pan or wok, melt the butter and quickly fry the walnuts until starting to get crispy. Add in the sugar and the cranberries and continue to cook until the sugar is dissolved and the cranberries are just starting to pop.